Halloween Real Estate Marketing Ideas: Trick or Treat! When its time to get the candy ready to pass out to trick-or-treaters, whether at the office or at home, take some extra time and expense with this neat idea. 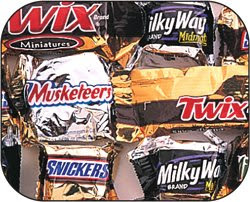 Fill small Ziplock baggies with candy and your business card. A great treat bag would include some mini-candy bars, suckers, bubble gum, etc. Be sure to get the stuff that everyone really likes! Then toss your business card into the bag and zip it closed. Most parents look through their children’s candy before allowing them to have any, and your treat bag will be sure to stand out! Hopefully they will hang onto your business card or pass it along to a friend! You could use magnetic business cards so its easier to keep it "sticking" around. Even if just one listing or sale were generated from this, it would be well worth it!